Last night’s documentary on The Glasgow Boys, presented by Muriel Gray, was an interesting survey of the exhibition, Pioneering Painters: The Glasgow Boys 1880 – 1900, currently on in Glasgow. Gray concentrated on the first of those two decades – rightly, because that was the period in which the group put Glasgow on the art world map, and when they produced their most lasting work. Taking inspiration from French realist painters as Bastien-Lepage, Courbet and Millet, the Glasgow Boys sought to liberate their art from the staid, dark toned narrative paintings in favour with the Scottish art elite at the time, and explore the realism of Scottish rural life and the effects of light captured through working out of doors. The most prominent painters associated with the group were James Guthrie, George Henry, Arthur Walton and John Lavery. 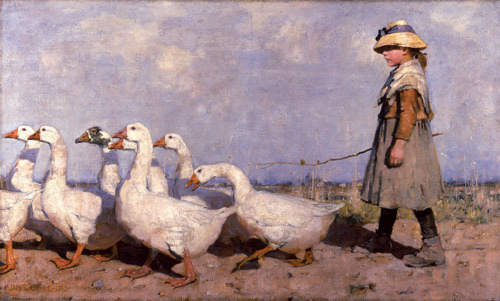 James Guthrie (whose works include ‘To Pastures New’ (above), and ‘Willie, Old Wurthy’ (below) lived most of his life in the Scottish Borders, most notably in Cockburnspath, Berwickshire, where he painted some of his most important works, including ‘A Hind’s Daughter’ (1883), and ‘Schoolmates’. 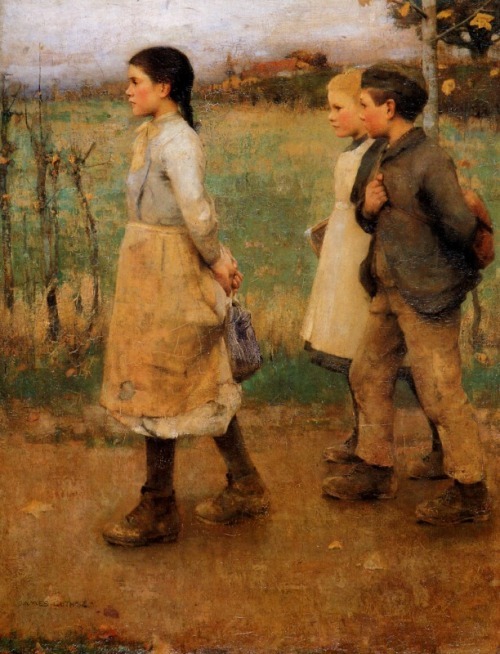 He was strongly influenced by the French Realists, especially Jules Bastien-Lepage. 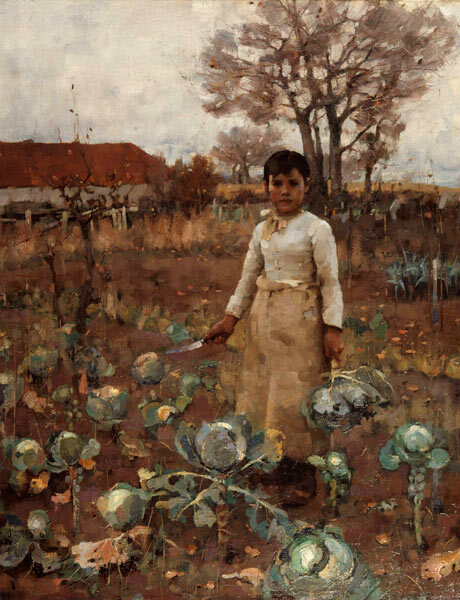 In James Guthrie’s picture, A Hind’s Daughter, a girl straightens from her work in the fields and looks directly at the . . . “camera” should be the word here, because so much about her suggests a sudden interruption: her stare is straight and intrigued and she hasn’t had time to set down the knife in her right hand nor the cabbage in her left. But this, of course, is a painting, one of the finest to have come out of that loose grouping called the Glasgow Boys and now borrowed from the National Gallery of Scotland for the show, Pioneering Painters: The Glasgow Boys, which opens today at the Royal Academy. “Hind” is an old Scots word for farm servant. The title and scene imply that the girl has been sent to cut cabbages for the farm kitchen. We know the date and the place: autumn 1883, at a farmyard plot near the village of Cockburnspath in Berwickshire. We see a cold day, trees nearly bare, a low cow byre or labourer’s cottage with red-tiled roof. But what does the girl see? Nothing in the process of picture-making can be certain, but it would be reasonable to assume that she sees a young man aged 23 or 24 standing a few feet away with a brush in his hand (such a delicate implement compared with a knife fit for cabbage stalks) and dabbing at a piece of canvas or board which is the picture’s preparatory sketch. She may know that he and two friends, Edward Arthur Walton and Joseph Crawhall, shared a house in the village that summer, and that for a month or two it was impossible to walk across her part of Berwickshire without encountering a hatted and booted young man, socks rolled over his trouser bottoms, who was squinting at the view and bending over an easel. Cockburnspath had a little station on the main line between Edinburgh and London. Not many trains stopped, but those that did in the summer of 1883 (and for two summers after) often brought their quota of young painters. George Henry, Arthur Melville, Corsan Morton, Whitelaw Hamilton, Alexander Roche: all of them about to become members of “the Glasgow school” when the name was bestowed, but at that time no more than acquaintances in separate endeavours. Some stayed for a day or two and others for longer, but only Guthrie persevered through two miserable winters there, remote from the fellowship of his painter friends in Glasgow and with only his mother for company. What would the hind’s daughter have known about the man who stood in her field on that autumn day, with his friends gone home to the city? Some facts might have come out in local conversation: that he was a clergyman’s son from Greenock who’d abandoned his law studies at Glasgow University to try to forge a career as an artist. But the reasons for him being there, in a field in a farming village in Berwickshire, would have been more opaque. He could have said that he preferred the more dependable and crisper light on Scotland’s east coast to the more changeable, moister atmospheres of the west; or that the fields here – this was one of Scotland’s richest agricultural areas – were busier with the kind of labourers he wanted to paint. What both statements added up to would have baffled the people of Cockburnspath. Guthrie and his fellow painters had decided that the village and the fields around it made a very good stand-in for France. – from Life Among The Cabbages in the Guardian Review. 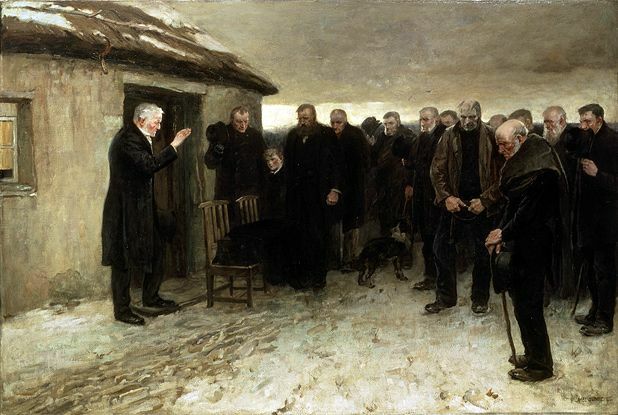 The opener is James Guthrie’s ‘A Funeral Service in the Highlands’: a frieze of black figures against a plangent white sky, the minister raising a hand in blessing on the left, a dark blank of a shape standing for the coffined body. Apart from the traditional exclusion of women from the Highland funeral, Guthrie’s composition irresistibly recalls Courbet’s ‘A Burial at Ornans’ – except that the Presbyterian version is tidy and weak. There is no obvious proof of theft, for Guthrie had not yet been to Paris, so could not have seen the painting first-hand. But Courbet’s devastating Burial… was in the news, and widely reproduced, having recently been bought by the Louvre. Always carry a sketch-book. Select a person – watch him – then put down as much as you can remember. Never look twice. At ﬁrst you will remember very little, but continue and you will soon get complete action. It comes as no surprise to learn that Lavery and Guthrie became society portraitists: like ‘Schoolmates’, ‘The Tennis Party’ covets the attention of the wealthy. Hugh Stevenson, writing in the catalogue, confirms as much when he suggests that several Glasgow Boys left behind rustic realism to search for new subject matter “calculated to appeal to their British patrons”. Nothing wrong with that, you might think: all of us have to earn a crust. Except the title of this exhibition is Pioneering Painters. By the end, I was still in the dark about what, precisely, the Glasgow Boys pioneered. I understand that they railed against the staid conventions of the Royal Scottish Academy, letting in light and fresh air. But the artists they most admired in France weren’t avant-garde contemporaries such as Manet, but members of an earlier generation (such as Millet). The Glasgow Boys have sometimes been called Scotland’s Impressionists, but, noticeably, Guthrie and co didn’t imitate the radical brushwork of the real Impressionists in Paris. As a result the paintings of the Glasgow Boys feel pretty but tame, especially when you consider that they were working on the cusp of the modern era. Compare Guthrie’s 1886 portrait of ‘Old Willie’, a weather-beaten rustic, with Cezanne’s paintings of Provençal peasants from the 1890s, some of which are currently on show at the Courtauld Gallery in London. The former, a solid representation of an individual, is good. But the latter are timeless, monumental – and great. There seems to be a general agreement, though, that George Henry’s ‘A Galloway Landscape’ (1889) is one of Scotland’s most distinctive paintings. Henry’s picture with its flattened perspective and bold use of colour has been compared with the work of Post Impressionists like Gaugin. Take for instance ‘A Galloway Landscape’ of George Henry. It may be clever but it is not art. It is utterly destitute alike of perspective, atmosphere, and poetry, three very serious defects, as we take it, in a landscape picture. A truly great painting is endlessly mysterious and never quite reveals its secret. The flatness, the hot haze of umbers, pinks and yellow-olive, and the radical design of the dark burn or small river in the foreground, added by the artist to the ‘real’ view, can be continuously analysed. Perhaps Henry is nodding to Hokusai, yet there is also something of the Dutch Golden Age, and something, too, of the late landscape pastels of Degas, but in the end it’s a mystery, and I know of no painting that is like it. The Glasgow Boys were largely working independently of one another around1880, but all were convinced that the future of modern Scottish art lay in the naturalist style of painting already employed by a number of French and Dutch artists. They had one common aim – to paint everyday scenes out of doors as honestly as possible. The most important inﬂuence on the group at this stage was the French artist Jules Bastien-Lepage. Fortunately, his paintings were exhibited extensively in London’s major galleries from1878 to 1882. 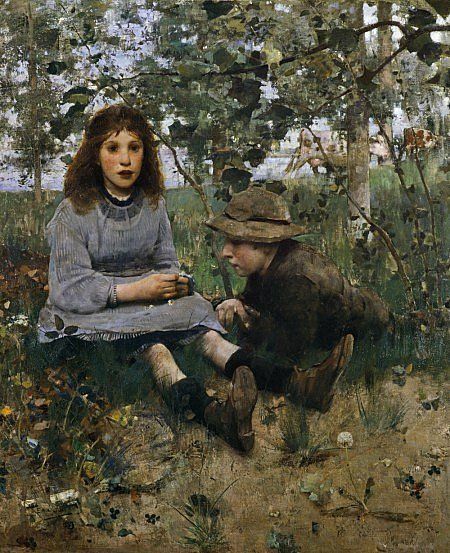 ‘Pauvre Fauvette’ was shown at the United Arts Gallery in 1882 and it exempliﬁes the qualities of naturalist painting that the Glasgow Boys admired. The single ﬁgure of a girl dominates this unsentimental image of rural life. Both her proximity to the picture plane and the high horizon line serve to ﬂatten the composition. These elements, combined with Bastien-Lepage’s distinctive square brush marks, give the work a strong sense of design. 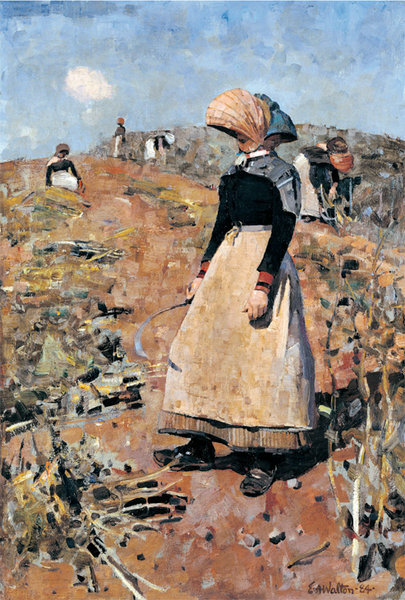 Perhaps Walton’s boldest work is Berwickshire Fieldworkers of 1884 which depicts a group of women harvesting and wearing curious bonnets called ‘uglies’. Made of a cane framework with cotton stretched over, they were worn to protect the wearer from the sun. 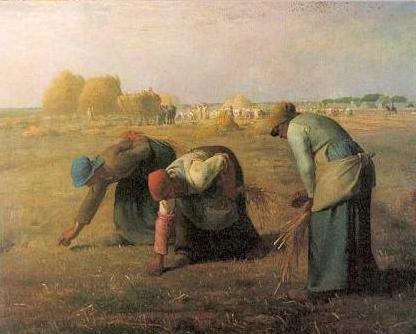 Walton has used the square brush and short horizontal strokes that were characteristic of many of the rural naturalists, and the painting shares the atmosphere – rural, nostalgic, quietly sympathetic – that marked French naturalism. The later works of these painters are painfully disappointing. Lavery became a slick society portraitist, and so did Guthrie, elevated to the presidency of the Royal Scottish Academy. Henry and his friend EA Hornel went to Japan and came back with kitsch pictures of geishas. Thanks for your comprehensive post. I have linked it to my blog about the exhibition. Hope that’s OK. Very nice post. I went to the exhibition yesterday without really knowing anything about the glasgow boys and came across your blog investigating further. Thanks! Thank you! It is great to find your detailed review. I enjoyed the exhinition. I will post this link on my FB page if it’s OK.
No problem! Glad you found it a worthwhile read. Thanks for a great post – very interesting. Guthrie’s ‘To Pastures New’ is a long-time favourite.